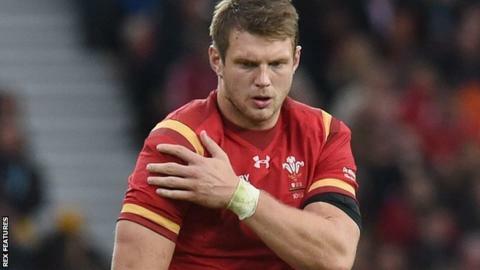 Wales fly-half Dan Biggar could be fit to train on Thursday ahead of Saturday's visit of Scotland - just four days after limping off in a 16-16 draw in Ireland. Forwards coach Robin McBryde confirmed Biggar was no longer wearing a protective boot, as his ankle recovers. He added full-back Gareth Anscombe was fit for selection against Scotland. "Dan is working with the medics around the clock to give him every chance," said McBryde. He added that Biggar "won't be in a position to train today" on Wednesday but agreed the Ospreys stand-off could train on Thursday. Wales name their team for the Scotland game on Thursday, with Bath's Rhys Priestland likely to start if Biggar is not fit. Priestland replaced Biggar after 20 minutes in Dublin, and kicked 11 points including a 40-metre penalty which gave Wales a three-point lead with eight minutes remaining. "Everybody's aware of the strengths that Dan possesses in the kicking game in particular and the ability to challenge and compete as he does in the air," added McBryde. "But Rhys has his own strengths and we saw on Sunday that we were able to attack in those wider channels and Rhys is very comfortable in playing that type of game. "And he proved that he's as good as anybody in regards to kicking under pressure. "So it's not a huge concern." Anscombe's late withdrawal in Dublin saw Liam Williams drafted in at full-back. Head coach Warren Gatland said that move had been a precaution to prevent aggravating a hamstring strain which Anscombe suffered in training two days before the match. McBryde confirmed the Cardiff Blues utility back was available for selection. Williams impressed as a late addition, though in the post-match media conference Gatland said he felt the Scarlets back was still not as sharp as he can be after a long injury lay-off.